Digital Marketing is equally important as any other main-stream marketing field in 2017. Everyone wants a piece of the digital marketing space. While all industries are vying to make it big in the digital marketing space (and rightly so) they can’t go with the same strategy and philosophy for every vertical. A fashion brands strategy should be different than a fitness brand or activewear products. The fitness industry is one of the booming avenues and will continue to grow in the coming years. Fitness industry today encompasses – Gyms, boot camps, wellness products, diet supplements, fitness and active clothing, machines and with extension sportswear as well. So, can you create a blanket strategy for the whole industry and assume it would work? While every sector mentioned above does fall under health and wellness industry their focus and customer base is different. Creating a solid strategy for your niche will help you get your Digital Marketing right in the first place. 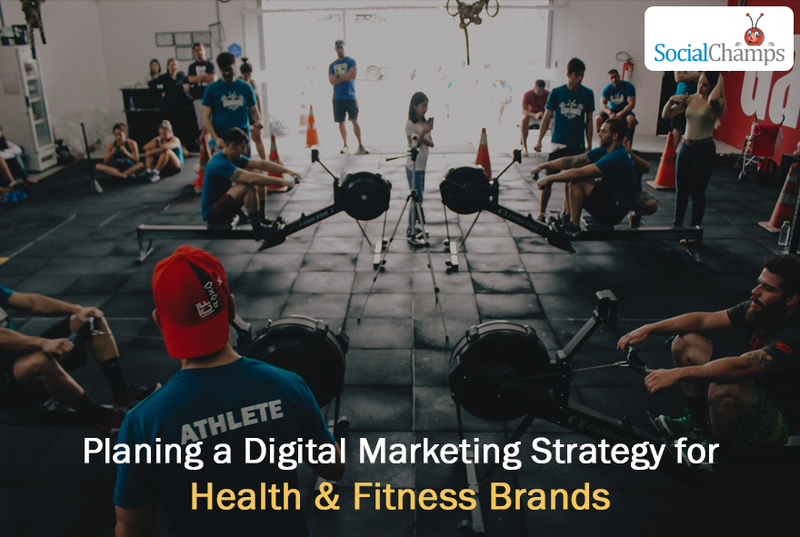 We have listed out a broad outline of steps to plan a digital marketing strategy for Health and Fitness brand. As mentioned earlier, every niche will have a different target audience. They might overlap to a small degree but your plan should be focused on the major chunk of your target audience. Developing a buyer persona means understanding and creating an outline of an ideal customer for your brand. Speak to your target audience, sift through the forums and reviews, and study the competition audience base to come up with the buyer persona. Try to be as detailed as possible by understanding. So if you are selling fitness food supplements, understand your audience. Once the buyer persona is defined, based on his behavior or preferences draw up a solid strategy that will resonate with your target audience. Define your end goals and then figure out ways to reach the end goals using digital touch-points. Keep in mind your offline promotion and tie it- up with your online offering. Continuing with our earlier example, if the customer sees your food supplement ads on television and then again while surfing the FB page, chances of him clicking on the page ads are more. Similarly, he might see a hoarding and google the brand name and find reviews about the same. Once you have come up with a solid strategy and goals, it is important to document it for future reference. While the end goals are important, do create small monthly or quarterly goals that will be seen as milestones and will help you retain your focus. Documenting the goals also helps you understand gaps if any, and helps you plug them before you roll out an elaborate campaign. It is also easy if you decide to outsource your online marketing effort, as the agency will have a clear understanding of what you are trying to achieve. So your immediate goal could be increasing brand awareness about your fitness product but the quarterly goal could be to earn 1 million in sales. Once all the planning is done, you need to focus on being consistent. This might sound simple but is tough to follow. It is always better than you plan ahead and use automation tools available for consistent online marketing. It reflects terribly on your brand if you are not consistent in your efforts or are putting out ambiguous statements. Imagine mentioning that you will be starting a new batch 4 days a week on one channel and mentioning only 2 days a week on some other channel! Or you have a Facebook page that was updated six months ago. These things will hurt your brand hence remember to take out time for being consistent. This is one of the clear distinctions from traditional media marketing. The digital marketing space is always evolving and there are new things being offered regularly. Staying abreast of these changes and using them for the benefit of your brand is an important aspect of digital marketing strategy. Make use of Facebook-live for how-to’s or quick Q&A sessions with fitness enthusiasts, make use of new Google Adwords updates for your latest ads, use ephemeral content system offered by Instagram or SnapChat. Depending on your master-plan allocate sufficient resources, time and money to make digital marketing a success. It is understandable that as a business owner you might be wearing many hats, and digital marketing might get side-lined or bundled up with traditional marketing. However, to enjoy success, it is essential that you either allocate resources in-house or hire an external agency that can focus and manage the end-to-end digital marketing for your health & fitness brand. Having a strong digital marketing plan will help you determine the extent of resources you will require thereby giving you ample time to plan in advance. Once you have identified the target audience, outlined a plan, decided on goals and come up with strategies to achieve those goals, the next step will be to measure the results of your efforts. For eg: If you are a Gym owner, you will be looking at increasing memberships and will compare your current month memberships with last month’s memberships to understand the result of your marketing efforts. Similarly, if you are a wellness product brand then you will be more focused on product reviews. This is a continuous process. Depending on your goals and understanding the current results you will plan and strategize for the next step. Only based on the effectiveness of current plans will you be able to draw up your future course of action. Very useful info.Every Digital marketing executive need to implement these points which helps to make effective results.Thanks for sharing your views.